The 8782B is a quite powerful generator to simulate digital signals, not considering the power in dBm, but the support of all the common digital modulation schemes, BPSK, QPSK, 8PSK, 16/64/256 QAM, at exeptional signal integrity. 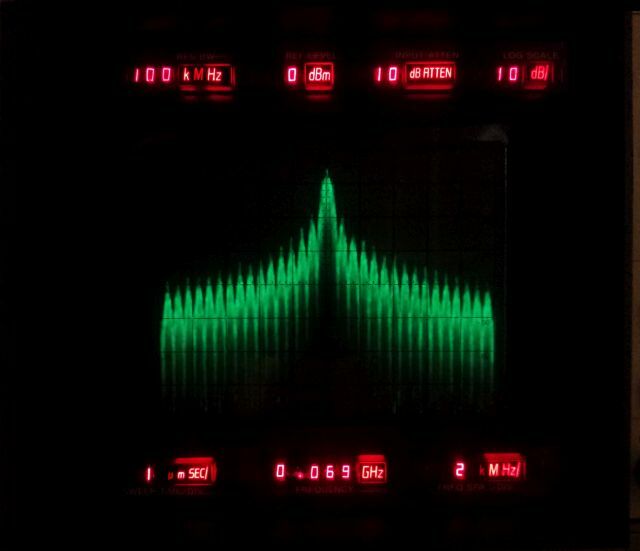 Frequency range is 0 to 250 MHz, actually, it works to 370 MHz – but this instrument is mainly intended to generate complex IF signals, which can then be used to test the IF chain of a receiver, or, you just add a mixer, another generator for the LO, and a filter, if needed, to get the signal up into the GHz region. This unit arrived in a HUGE box, it just fits the car! All frequencies are derived from a HP 10811E ovenized oscillator, which is held by a shock-absorbing mount, and is extremely stable (better than 0.5 ppb per day! ), and low phase noise, resulting in below -125 dBc at 1 kHz from the carrier, and below -130 dBc further out. 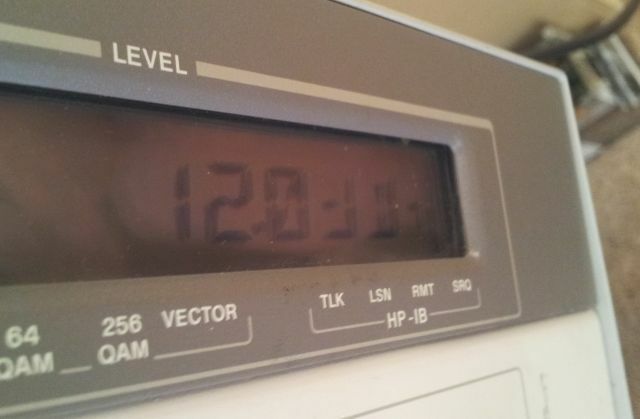 (1) The right LCD display is missing partial digits. Seems to be related to the mounting/contact of the LCD with the board. (2) Output is 30 dB down, but otherwise working just fine. Quick look at the output amplifier – a real marvel of RF engineering. (3) It’s in good condition, but will benefit from a bit of de-dusting and cleaning. 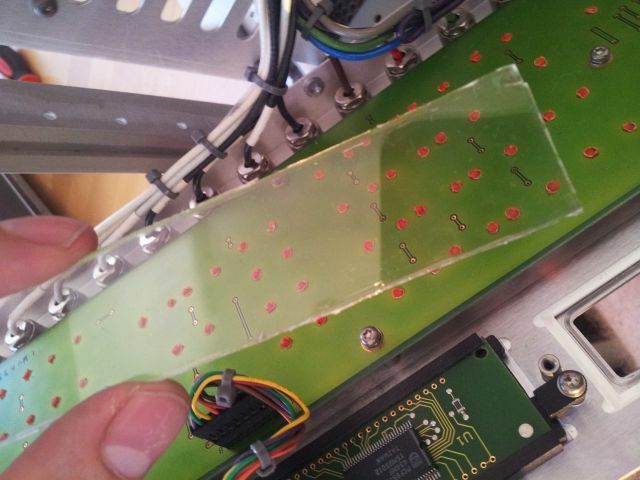 (1) After taking off the front panel, the LCD is a separate assembly, seems to be made by HP (which test equipment company would nowadays still make their own LCD displays? ), and easy to remove. And, the defect, readily found. One of the side bars holding the assembly together and pressing the glass display to the control board, to make contact via an elastic strip, it had slipped off. The root cause – somebody must have used nail clippers to fabricate a piece of acrylic that is used to protect the LCD surface – maybe it was broken or scratched. And with the uneven edges, it caused tension on the display unit, pushing off the side bar. Well, Let’s just straighten out things and put it back together. No surprise, the LCD is working again just great. (2) The level control. According to the description of the sender, the output is about 30 dB down. Most likely, something with the attenuator, 08780-60093 = 33322GC, 110 dB, 10 dB step. 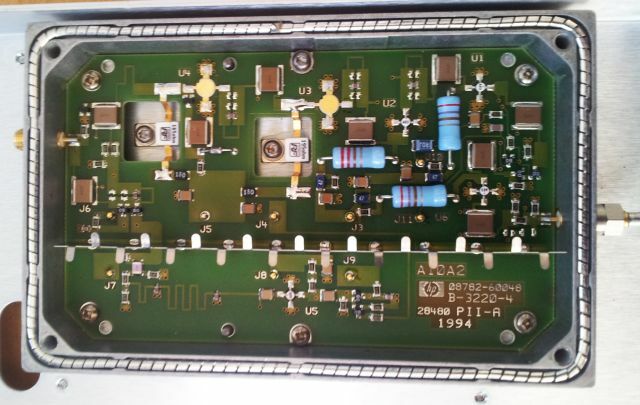 So, the attenuator, easily removed, and the non-attenuated signal directly fed to the dated but very trustworthy HPAK 8565A spectrum analyzer available here at the bench. Now there is plenty of signal, but it isn’t accuarate at all, even relative steps, like 1 dB steps, give variable response, anything from 0.5 to 2 dB steps… The level spec of the 8782B isn’t all that great, but I know from earlier work with such units, the performance is much better than spec, and 1 dB step, should be 1 dB. Turns out, just a little pitfall, the 8782B has a calibration routine, also for the level, and somehow, this unit seems not to have been calibrated for a while. Well, easy enough, just pushed the “CAL” button, and after a few minutes, you bet, the levels are spot-on, and, within 0.1 dB or so. Just a quick fix on the attenuator control circuit, and, the level is back. (3) For cleaning, don’t use anything too harsh on these instruments, they use different plastics and pains compared to earlier HP models. I get good results with about 20-25% isopropylic alcohol (1 part of the alcohol, 3 parts of distilled water). And, with the 8782B the boring times in the lab are over, Thank’s to the build-in game – everyone will be looking at you, working hard, pushing the buttons!